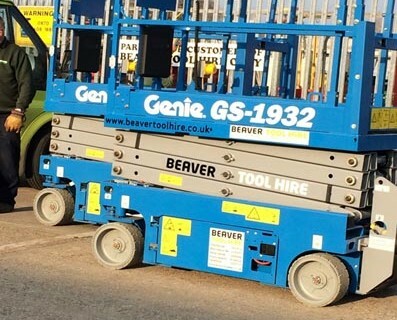 We have recently expanded our scissor lift fleet with the addition of two Genie GS1932 machines – the units give a working height of 7.8mtrs and will fit through a 80cm wide doorway. Performance, reliability, serviceability and value: The 32’ Series scissors offer outdoor (1 person) and indoor (2 persons) functionality on firm, level surfaces, providing accessibility for a wide variety of applications. Low-emission electric scissors deliver a quiet, convenient method for operation in sound-sensitive environments like office buildings, shopping malls, hotels, schools and more. Front-wheel drive and zero inside turning radius for excellent manoeuvrability in tight spaces like congested construction sites, elevators and narrow aisles. Standard solid non-marking tyres. On-board diagnostics help operators troubleshoot on the fly and make adjustments in the field to maximize uptime. Swing-out battery box and power module trays allow easy access to engine components for convenient service. These Genie machines are assembled in the UK at the company’s Coventry factory. Contact Chichester branch for further information: Telephone: 01243 782510. Copyright © 2019 Beaver Tool Hire Blog. All Rights Reserved.